67% of mobile visitors are unlikely to return to a site if they had trouble. 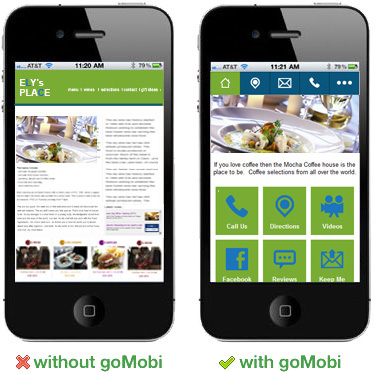 With goMobi's mobile site builder, customers will have a great mobile experience from any mobile device. Thank you for your interest in goMobi Site Builder. Please log in to complete your purchase. Click "Add Product" to complete your purchase of goMobi Site Builder. Introductory prices apply to the first term. Money-back guarantee applies to hosting and domain privacy. All plans and products automatically renew unless you cancel. The renewal will be for the same term length and at the regular rates reflected in your Control Panel. The payment method you provide today, or we have on file, will be used for renewals, unless you change it or cancel. You may cancel at any time by logging into your account online or by calling customer support at 866.434.5563. Buy now and save 60%! *Promotional price of $1.98/month is for the first payment term only. After the first payment term, goMobi automatically renews at its regular rate ($59.40 for the 12-month term, $107.76 for the 24-month term, $143.64 for the 36-month term).